To the 1852 readers of Uncle Tom's Cabin, a house told much about its inhabitants. As the Industrial Revolution changed the way Americans worked, it also changed the way they perceived the home. Beyond just a measure of their financial prosperity, a home was a mirror of the family's happiness and virtue. Once a center of production and an economic as much as a social unit, in the nineteenth century the family - and the single-family dwelling - became understood as a sanctuary from the harsh, demanding world outside. This new perception called for the creation of a model, an ideal to which the average family could aspire. The movement coalesced into a housing reform campaign, led by architects, feminists, and ministers but sustained by the average citizen, he or she who followed the plan-books and heeded the advice proffered by the "experts." 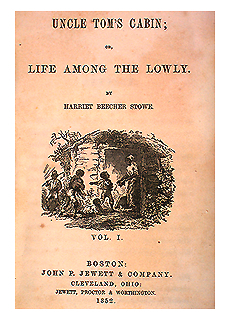 In her personal life and in her first novel, Uncle Tom's Cabin, Harriet Beecher Stowe is both leader and follower in this movement.